Derric Crowther attended Atlanta Public Schools prior to attending prep school at the Northfield Mount Hermon School in Northfield, MA. As a young boy, Coach Ronald Brown and Ken Johnson drilled in Derric that he "could do all things through Christ." In 1986, Derric entered the University of Pennsylvania, where he was a mentee of the late Judge A. Leon Higginbotham; student of the legendary Student Nonviolent Coordinating Committee (SNCC) Leader, Julian Bond; as well as, member of an Ivy League Championship football team. Derric graduated from the University of Pennsylvania in 1990. After graduating from Penn, Derric worked in several positions prior to going to law school, but none was as rewarding as his time spent on active duty during Desert Shield/Desert Storm. 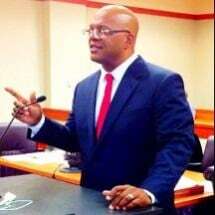 In 1996, he earned his law degree from the University of Dayton Law School where he was a Dean Scholarship recipient, member of the National Mock Trial Team, member of Moot Court Team, and president of the Black Law Student's Association. He also completed an externship for United States District Court Judge, The Honorable Walter Herbert Rice. In 2003, Derric was a student at the Trial Lawyer's College and immediately thereafter invited to be a part of the staff where he served for years. In 2007, Derric began teaching as an adjunct law professor at John Marshall Law School. Since 2008, Derric and the firm have been sponsor and host in the Justice Bentham project. Derric's prior affiliations include: Henry Spiegel & Milling, Evert & Weathersby and KPMG. Mr. Crowther was featured in Georgia's Super Lawyers 2007 Rising Stars Edition.